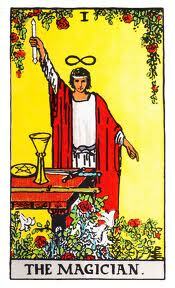 I had practised tarot for a a long time, since I was young. I had no idea that the person that I was involved with, was either a sociopath, or even that he was a compulsive pathological liar. Shortly before he ran off with money that he had stolen from me, before I realised that everything was fake, I had done tarot readings, which repeatedly brought up the magician card. It was reversed. The evidence, was right there in front of me. I did my tarot cards and said to him “I don’t understand, it is warning me, of a con man” he looked at me, and the cards and said “Well, that is rubbish, I am no con man”. I believed him because I didn’t want it to be true. I wrote, in my diary, a year ago today, how he had gone off, whilst I was in the shower, and was gone a long time, so say to the shops. I wrote how I didn’t trust him. The truth was, there was a reason for me to feel this way, as I later discovered, he wasn’t at the shop,he had taken my bank card, and was withdrawing cash. Planning his escape. He took £350.00 out of my account in two days. He was also using my card in shops. The evidence, was right in front of my eyes. I was suspicious. I sensed it. I felt it. I brought it up with him. But because I didn’t WANT it to be true, I still wanted the illusion. Because he was selling me MYSELF and exactly what I wanted and because he was lying, deceiving, gaslighting, and deflecting, I ignored the signs that were staring me right in the face. I trusted him more than I trusted myself! If you are in a relationship. And you see the signs, you sense deception, and you feel that something is not right. If the evidence is right there in front of you. Write it down. Go back to it. Revisit it. It is likely that your feelings are right!! The sociopath might tell you that you are being paranoid, stupid, use all his trickery and gaslighting to fool you some more. He is teaching you, to trust yourself. Would like to know more about the lesson to trust yourself? In what area is being addressed? I was dating a sociopath and in fact I everything was a perfect illusion but would like to know more if its only trust yourself as a gut or in other aspect. I think sometimes in life we give up trusting in ourselves, instead, we allow someone else to make decisions for us. Or we ignore our own instincts, instead of listening to our inner voice. Or if we do raise concerns, we are easily swayed by someone who is not truthful. After an abusive relationship, we can struggle with our judgement. Also trusting ourselves.